Nineteen people have been taken to hospital after the collision on Forest Road in Newport on Sunday afternoon. Two former circus lions have been settling into their new home at the Isle of Wight zoo after a 1300 mile journey from Spain. 5-year-old brothers Vigo and Kumba are currently being held at a rescue centre in Alicante in Spain. A yachtsman taking part in the racing at Cowes Week off the Isle of Wight has died after going overboard. Annual Bramble Bank cricket match takes place mid Solent! 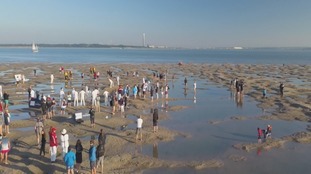 This year's annual Bramble bank cricket match has taken place in the middle of the Solent. The Isle of Wight festival is celebrating its 50th anniversary with The Killers, Kasabian and Liam Gallagher among the headliners. A council at the centre of a legal battle over unauthorised school absences is to review term dates. A major consultation is to be held. A troubled secondary school on the Isle of Wight which is facing an uncertain future received another blow today with the publication of a damning Ofsted report. Sandown Bay Academy is now set to go back into special measures after inspectors criticised the running of the school and levels of achievement. Pupils have been let down in the quality of education they receive for too long. Inconsistencies in teaching mean the pace of learning overall is too slow. And it highlighted turbulent leadership and a loss of confidence in the academy chain running the school. The Academies Enterprise Trust (AET) who are in charge said it's aware of the school's issues - as well as its strengths - and will address any weaknesses identified in the report. Our Social Affairs Correspondent, Christine Alsford reports. Thousands of people are heading to the Isle of Wight for the first of this season's music festivals. Rain and heavy wind caused some problems for those trying to put up their tents. But as Andrew Pate found out, the lure of big stars like Rod Stewart meant everyone was in high spirits. Andrew spoke to the festival organiser, John Giddings.